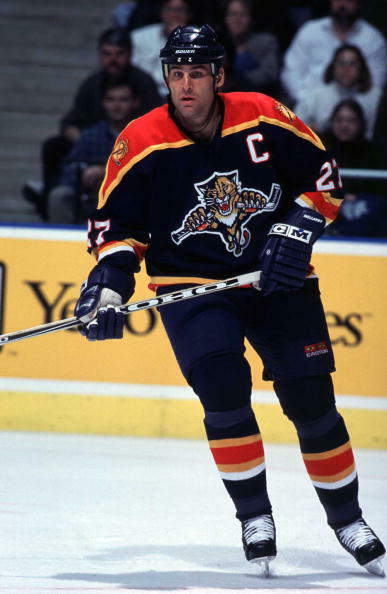 Scott Mellanby was the leader offensively for the 2nd-seeded ’99-’00 Panthers during the series and he also started the scoring in the series with a goal 47 seconds into Game 1. The ’99-’00 Panthers won Game 1 by a score of 4-2 with Mellanby’s goal and an assist leading the way. The 5th-seeded ’93-’94 Panthers then held a 2-0 lead at the start of the second period in Game 2, but the ’99-’00 Panthers scored two goals in the first three plus minute of the period to tie the game. However, just 46 seconds after Ray Whitney tied the game for the ’99-’00 Panthers, Jesse Belanger scored to give the ’93-’94 Panthers the lead right back and they held on for a 3-2 win. Game 3 was tied 2-2 after the first period with Mellanby scoring both goals for the ’93-’94 Panthers. Then, in the second, Dave Lowry scored at the 8:31 mark of the second to give the ’93-’94 Panthers a 3-2 lead and then Belanger scored an insurance marker as they won 4-2. The ’99-’00 Panthers then won Game 4, 3-1, with Mike Vernon stopping 42 of 43 shots against to lead them to the win. In Game 5, a goal from Mike Hough at the 4:33 mark of the third period gave the ’93-’94 Panthers a 3-1 lead. However, just under ten minutes later, in game time, the ’99-’00 Panthers tied the game at three with Mellanby scoring his second of the game to tie it. The game finished regulation tied 3-3 and then in overtime, Mellanby completed his hat trick with the overtime winner 13+ minutes into the overtime period. Then, in Game 6, the trio of Hough, Stu Barnes and Brian Skrudland all posted a goal and an assist each to lead the ’93-’94 Panthers to a 4-2 win, which forced a Game 7. The two teams were tied 1-1 after the first period of Game 7, but then in the second, the ’99-’00 Panthers rallied off three goals to take a 4-1 lead into the third. In the third period, the two teams combined for five goals. Mellanby scored twice for the ’93-’94 Panthers with a goal from defenseman Jaroslav Spacek for the ’99-’00 Panthers sandwiched in between. Then, Whitney scored his second of the game to give the ’99-’00 Panthers a 6-3 lead, which would be more than enough. The ’93-’94 Panthers brought it to 6-4, but the ’99-’00 Panthers took Game 7, 6-4, to clinch their first berth in the Ultimate NHL Playoff. The ’99-’00 Florida Panthers are the 27th team to qualifying for the upcoming 2015 Ultimate NHL Playoff. It will be their first trip to the tournament and they are the 11th team that will make their debut in the upcoming 2015 Ultimate NHL Playoff. Up next is the 2015 Buffalo Sabres Qualifying Tournament! This entry was posted in Qualifying Tournament, Ultimate NHL Playoff and tagged Briand Skrudland, Dave Lowry, Florida Panthers, Gord Murphy, Jaroslav Spacek, Jesse Belanger, John Vanbiesbrouck, Len Barrie, Mike Hough, Mike Sillinger, Mike Vernon, Qualifying Tournament, Ray Whitney, Robert Svehla, Scott Mellanby, Stu Barnes, Ultimate NHL Playoff. Bookmark the permalink.